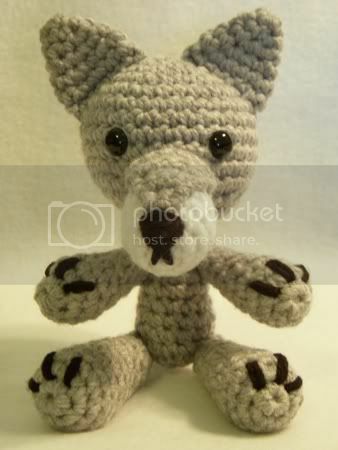 I've created my first original amigurumi pattern - a wolf. I wanted to crochet a wolf for a friend who was going off to school at the University of Nevada - Reno (their mascot is the wolfpack). But I couldn't find a wolf pattern online that I liked, so I decided to write my own. Coming up with my own pattern was easier than I thought it would be - I just started crocheting and if I didn't like the way the it was going I just ripped the stitches out and started again. As I crocheted I kept a log of how many stitches I used in each round and made notes if I used any special increases or decreases. This type of pattern was easy for me to read, but when it came time to post it online I realized that many crocheters would have no idea what to do with my crazy list of numbers! To find out how an amigurumi pattern should be written, I looked online at other free patterns created by bloggers and picked the three that I thought were easiest to understand: Ana Paula's, Planet June's, and Nimoe's. I then used the writing style of these patterns as a guide to how mine should be written. After writing up my pattern properly I tested it by using it to create another wolf. I hope you enjoy this pattern and I'd love to see photos of any wolves you make using it. If you have any questions or find any errors please let me know in the comments section. Update 8/16/09: Cissi of Amigurumi på svenska has translated this pattern into Swedish! 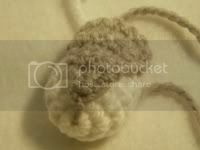 TailNote: The tail is crocheted with most of the increases on one side of the tail and most of the decreases on the other so that it will have a curve. i love this! i had been looking for an ami wolf too and this one was def the cutest >,< im making him now, he isnt done but when i finish i'll post some pics. thank you for the pattern! This wolf is just soo nice. I've made one for my daughters class, which is named The Wolves. 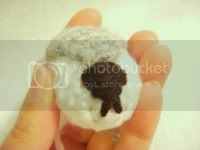 I have an amigurumi blog in which I translate and publish English amigurumi patterns into Swedish. I put a link back to the designers blog. All patterns are of cause free. 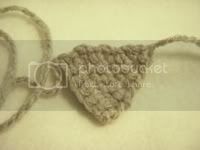 You are welcome to visist my blog before you make your decision at Amigurumi på svenska. 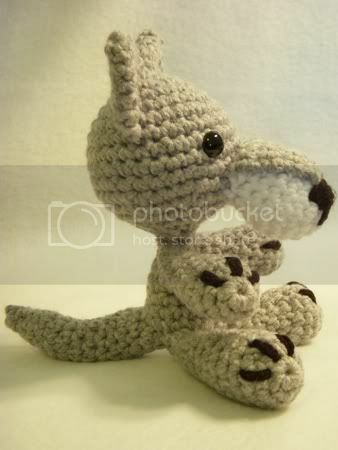 I must learn how to crochet because I will scream if I don't make a wolf soon!!!!!!!!!!! Love the idea of a wolf, have a dear friend I want to make one for! Thanks, I'm so glad you like it! No, I'm not on Ravelry yet. Do you recommend it? What a cutie!!! Neatly done! Thank you so much for sharing. Ah! I love this! The only problem is that I cannot crochet. But! My bestfriend can lol, I'll do the embroidery nose and such :) Because that's my specialty. Sounds good, let me know how it turns out! 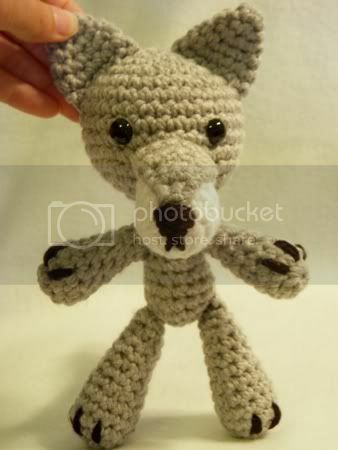 im making one for my boyfriend he loves wolves but im having little issue with body i got the head but when i finish the body it seems so tiny compared to the head. i tryed doing extra rows but it looks like an alian any advise? Does your body look about the same size as the body in my pictures? If it does, then you're probably doing it right. I purposely made the body very small but once the legs, arms and tail are sew on, it doesn't seem so tiny. Rnd 19: [2 sc in next st, sc 3] three times (15 sts). Rnd 20: sc around (15 sts). Rnd 21: sc around (15 sts). Rnd 22: [2 sc in next st, sc 4] three times (18 sts). Rnd 24: [sc2tog, sc 4] three times (15 sts). Rnd 25: [sc2tog, sc 3] three times (12 sts). Rnd 26: [sc2tog] three times (6 sts). What I did was add two rounds, which makes the body taller, but also increased the number of stitches in the biggest rounds from 15 to 18 so the body will be wider as well. Try that out and if it is still not big enough, then add in more rounds and stitches like I did above. If the body gets too big, you may need to add extra rounds to the legs, arms and tail so they don't look stumpy compared to the body. Hope this works! Please let me know if you need any more help. I made this and it's sooooo cute :) I had to change it up on the body and legs but it came out sooo cute!! This is for my boyfriend >w< our anniversary is on Halloween so it just seems fitting for a Halloween anniversary to my little wolfy :) thank you soooo much!!! It reminds me of the wolf from "Hoodwinked" Very Cute! I know it's been a while since you posted this pattern but I'm just discovering crochet and amigurumi. This has been the first amigurumi project I've made and you've got me hooked. Thanks for sharing. I'm so glad you like the wolf. 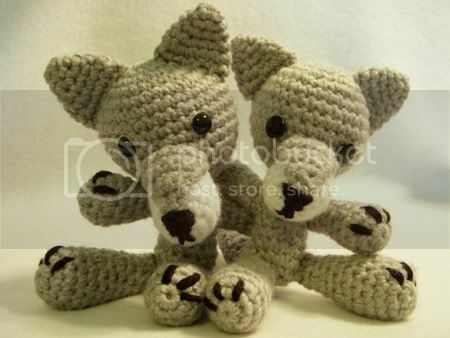 I wish I could help you, but I do not have the time to make a video that shows how to crochet the entire wolf. 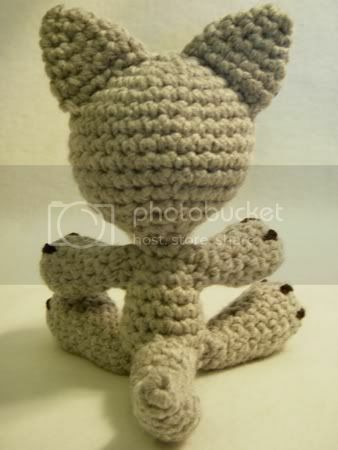 If videos help you learn, I would suggest going to Youtube and searching for "how to crochet" or "how to make amigurumi". If you watch enough of those and practice then you should learn enough to be able to make the wolf. If you still need more help, you could print out the pattern and take it to your local yarn or craft store. Maybe someone there can give you some pointers. Thanks for the pattern that makes such a nice Wolfie :-) I stumbled upon it in search for a babyshower gift to make and it was a like at first sight! I'm Dutch and not very used to English patterns yet, but I could follow the pattern quite well and the Wolfie turned out so cute!